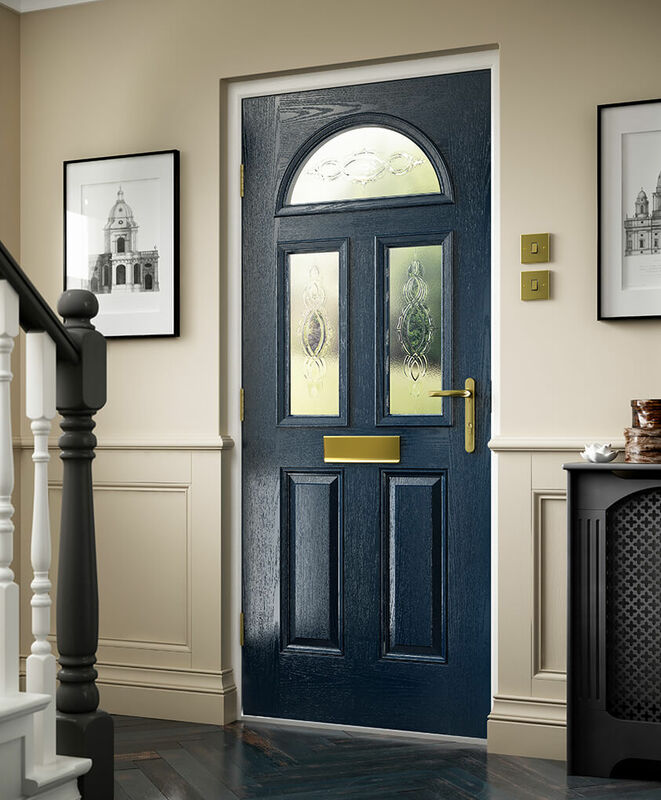 Supplied from the exceptional Distinction doors’ traditional range, traditional composite doors feature a highly insulating foam core, which retains the heat in your home superbly. The exterior of the door is finished in a robust glass reinforced plastic (GRP) skin, which looks incredible and protects your home from the weather. Our traditional composite doors keep unwanted noise out of your home very well. Able to achieve an A energy rating, they’re also incredibly energy efficient. This means you can benefit from a lovely home environment that is warm and quiet. Naturally, a warmer home will require less money to heat, meaning you’ll be saving on energy costs too. The GRP exterior has been designed to replicate oak woodgrain, ensuring for an absolutely stunning look. Designed to continue looking great for years, you’ll quickly become the envy of your whole neighbourhood. Due to an ultra-dense foam core, they’re 17% more thermally efficient than solid timber core and panelled doors. Thanks to a highly efficient locking system and robust exterior, your home is securely protected from would-be intruders. The glass reinforced plastic (GRP) skin fortifies the door tremendously, ensuring it is highly resistant to even the most testing of weather conditions. Our traditional composite doors come with a 25 year structural warranty, emphasising the level of quality that’s on offer. With a huge variety of stunning finishes to choose from, you can easily match your new door to your property and individual desires. Dual colour options are available too, enabling you to match the interior of the door to the inside of your home. The glass on T&K’s range of traditional composite doors is available in range of beautiful decorative options. Complete your doors’ unique look with a style of your choosing. Our composite doors are constructed from a combination of materials, including a glass reinforced plastic (GRP) skin and an ultra-dense foam core. This ensures for incredible levels of performance. However, T&K also supplies contemporarily styled variants, as well as uPVC, aluminium and timber entrance doors. Customise the handle, letterplate, knocker and rain deflector on your new door in a colour of your choosing. Regardless of your chosen colour, the quality of finish is nothing short of exquisite.